St Mary’s church in Wreay is the strangest and most magical church of Victorian England. 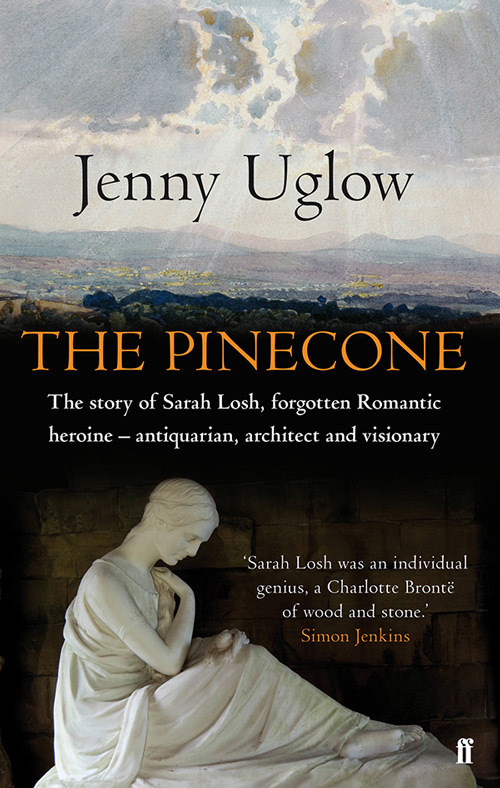 This book tells the story of its builder, Sarah Losh, strong-willed and passionate and unusual in every way. Born into the local landowning family of Woodside, heiress to an industrial fortune from alkali works on the Tyne, Sarah combined a zest for progress with a love of the past. Her church is her masterpiece and here she let her imagination flower, with the carvings of ammonites, scarabs and poppies; the arrow piercing the wall, the tortoise gargoyle launching itself into the air – and the pinecones, her signature in stone. The church is a dramatic rendering of the power of myth and the great natural cycles of life and death and rebirth. Sarah’s story is also that of her radical family, of her love for her sister Katharine, and of the life of the village and the city of Carlisle – the struggles of the weavers, the coming of the railway, the findings of geology, and the fate of a soldier, James Thain, far away in the Afghan war. Above all though it is about the joy of making and the skill of local, unsung craftsmen. This is life of an extraordinary woman, a region, and an age.